Sabine Hielscher attended the STTF2013 Summer School entitled ‘Sustainable Technologies and Transdisciplinary Futures: From Collaborative Design to Digital Fabrication’ in Lisbon in the summer of 2013. The summer school brought together researchers and practitioners (from STS, Social Science and Humanities, Architecture and Engineering, Communication and Media, Service and Product Design, Computer Science and Environmental Studies and Management) to design interactive prototypes for specific social groups (such as communters) that pass by or use the shoreline of river Tejo in Lisboa, using digital fabrication technologies. 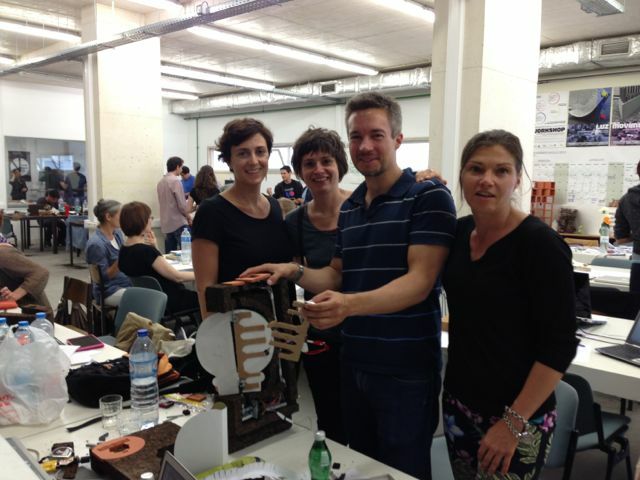 In addition to informal discussions and activities within working groups, the six summer school days consisted of Masterclasses (given by practitioners such as Tomas Diez (FabLab Barcelona) and Alex Schaub (FabLab Amsterdam)) and Hands On Sociotechnical Workshops within ISCTE-IUL University Institute’s FabLab. On the sixth day, the working groups came together to share their prototypes and conceptual ideas through presentations, performances and experimentations. Prototype outcomes included: ‘Cool Hotspot’; ‘Estou Aqui (I’m here)’; ‘@100 Abrigo’; ‘Sailorscope’; ‘CURL’; ‘Como e? (What’s up)’; ‘Lisbon Waves’ and ‘Transitos Publicos (Public Transits)’ (follow the link for videos and demonstrations of prototypes: http://sttf2013.iscte-iul.pt/outputs/prototypes). The days of the summer school were extremely inspiring. It was fascinating to experiment with digital fabrication technologies and to meet some really interesting people working in the area. The organising team was very welcoming. They did an amazing job with the programme and making us gel together as a group. The Portuguese food is fantastic!